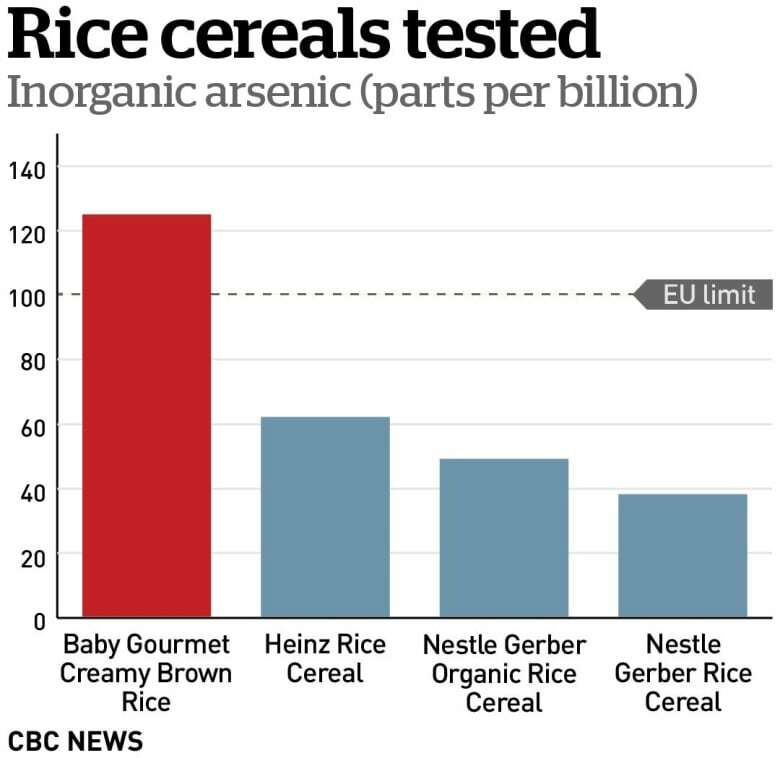 A CBC Marketplace-Radio-Canada investigation into baby cereals and snacks has found that the arsenic levels in two Canadian rice-based products would see them pulled off store shelves in Europe, according to one of the world's leading arsenic experts. Concerns about arsenic in rice-based products have been growing in recent years, with both Europe and the U.S. taking action on products specifically intended for infants and toddlers. Rice cereal is often a baby's first solid food, as it is easy to digest and often fortified with iron, and the grain is generally a common ingredient in many staple products for young children. 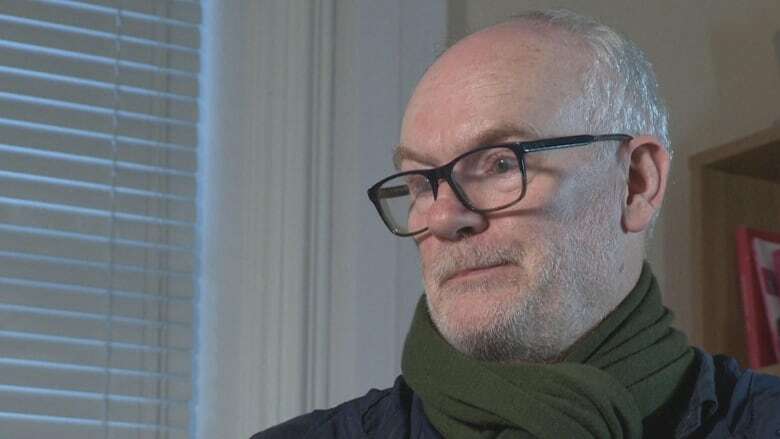 Arsenic expert Andrew Meharg, a professor at Queen's University Belfast in Ireland, who has been studying arsenic in rice for decades, says he's concerned about the levels of the chemical element found in some rice-based baby foods in Canada. "We should not be exposing young children, at the most sensitive time of their life, to toxic chemicals, and if we can avoid it, we should," said Meharg. "In the case of baby foods, we can avoid it." To conduct the investigation, Marketplace purchased 50 packages of seven different kinds of infant cereals and seven different kinds of snacks at major retailers in Calgary, Toronto and Montreal, buying well-known brands — Gerber, Heinz, Baby Mum-Mum and Parent's Choice — as well as products from three Canadian companies: Love Child, Baby Gourmet and PC Organics. The packages — mostly rice-based — were shipped for arsenic testing to Brooks Applied Labs near Seattle, a lab that specializes in trace chemicals and arsenic-speciation testing. What about the rice we all eat? Learn more about the risks around arsenic in rice and what you can do about it. Tune into Marketplace at 8 p.m. on CBC TV or online. Arsenic is a naturally occurring element that's present in the environment, meaning it's found at low levels in many foods. However, it is commonly found in higher concentrations in rice than other grains. Arsenic can form naturally or be a byproduct of human activity, such as industrial and farm waste, including the former use of arsenic-based pesticides. While arsenic-based pesticides are now banned in most parts of the world, arsenic can remain in the soil and water. Rice tends to absorb arsenic more readily than other crops. There are different forms of arsenic, with one type in particular, inorganic arsenic, considered the most toxic. In this case, "inorganic" is a chemical term and does not refer to the growing method; in fact, "organically grown" rice has little bearing on arsenic levels, as arsenic is absorbed by plants regardless of whether they are grown under conventional or organic farming practices, according to the FDA. Inorganic arsenic has been classified as carcinogenic by the International Agency for Research on Cancer (IARC). While Marketplace's test results showed that all of the rice products had higher amounts of arsenic than the non-rice options, two products in particular stood out. PC Organics Whole Grain Puffs and Baby Gourmet Creamy Brown Rice cereal both had levels over what would be permissible in Europe. None of the other products tested surpassed the European limits. 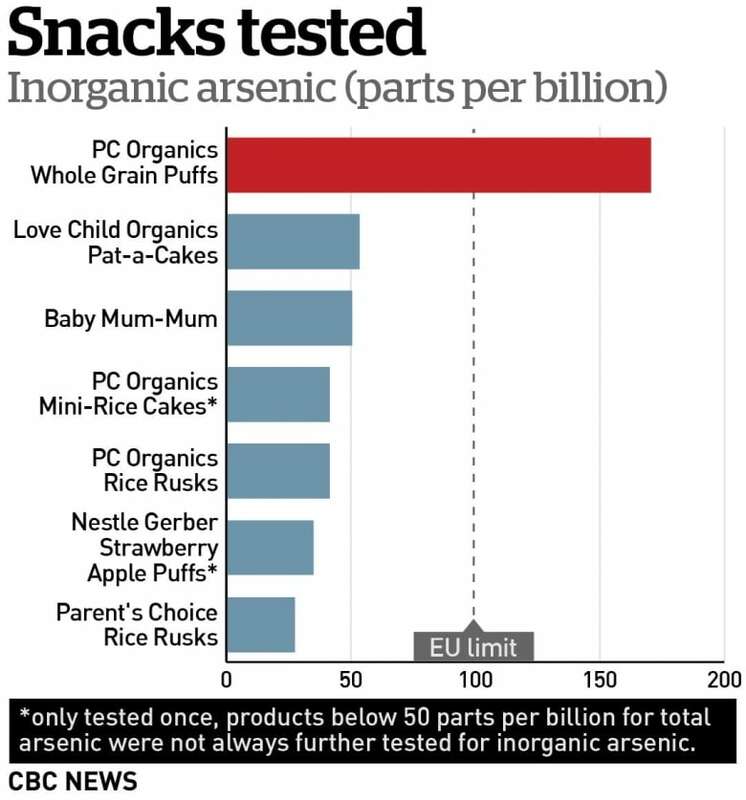 PC Organics Whole Grain Puffs had on average 170 parts per billion (ppb) of inorganic arsenic, according to the test results of multiple samples, while Baby Gourmet Creamy Brown Rice Cereal had on average 125 ppb of inorganic arsenic. Arsenic averages are based on test results from at least three different packages, unless otherwise noted. Both products also had high levels of total arsenic — a combination of inorganic arsenic and all other arsenic compounds. 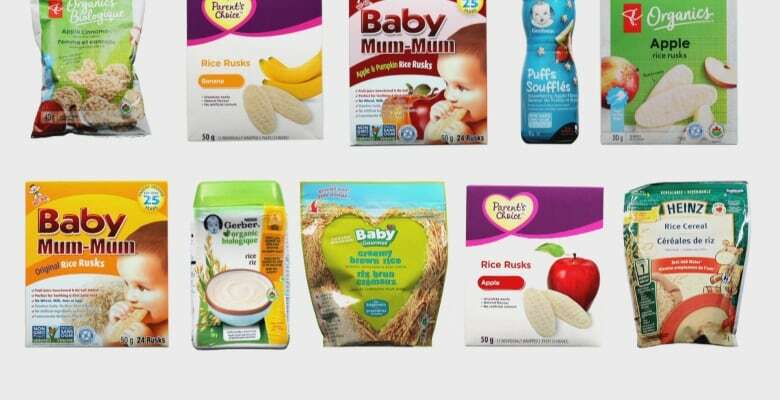 "I've not really come across such high levels in baby-food products in Europe," Meharg said after reviewing Marketplace's results. "I do not recommend giving children food products with such high levels of arsenic in them. They are not safe." While Canada has limits for the amount of arsenic permissible in drinking water — set at a maximum of 10 parts per billion — there is currently no Canadian limit for arsenic in rice-based products for infants. However, in 2015 the European Commission passed a law that limits the permissible amount of arsenic in all rice-based foods for infants and young children to 100 parts per billion (ppb) of inorganic arsenic. In the U.S., the Food and Drug Administration (FDA) released a risk assessment in 2016 that found "eliminating rice and rice products from the diets of infants … could reduce their lifetime cancer risk from inorganic arsenic in rice and rice products by six per cent." The FDA further said that if children below the age of six avoid rice and rice products altogether, they could reduce the lifetime cancer risk from inorganic arsenic in rice and rice products by 23 per cent. The FDA subsequently released guidelines to American industry aimed at curbing the arsenic levels in baby food, using the same 100 parts per billion standard as Europe. The guideline isn't legally enforceable — and the FDA has taken some criticism for that — but some industry watchers believe there are signs some rice-product manufacturers have responded and are working to lower the levels of inorganic arsenic in their rice products for infants. There is ongoing debate regarding how — or if — adults may be affected by low-level arsenic exposure over time, but experts agree that when it comes to children, less is better. So while you don't have to strike rice from you or your baby's diet altogether, experts suggest you diversify it with other grains, such as oat, bran, barley and wheat. Pound for pound, babies eat more than adults, which can mean they have a greater tendency to absorb more of these substances and the potential for a greater concentration of arsenic in their small bodies. According to the European Commission, dietary exposure to inorganic arsenic for children under the age of three, including from rice-based foods, is estimated to be "about two to three-fold that of adults." Studies have shown that arsenic exposure is most harmful to pregnant women and young children, especially babies. Arsenic exposure can lead to trouble in brain and growth development and an increased risk of unhealthy immune system. "People should be concerned about arsenic in general — it's poison," said Marion Nestle, a nutrition expert who has written a number of books on food policy, including Food Politics and Unsavory Truth. "It's a poison that raises the risk for chronic disease. And it's particularly a concern for children, because they're young and small and growing. It affects their cognitive function and it's better to have less than more. We don't know what a safe level of arsenic is. That means less is better." And while the EU has brought in regulations and the FDA has put out guidelines, there are currently no rules in Canada around the levels of inorganic arsenic in rice-based baby food products. Dr. Supriya Sharma, a senior medical adviser with Health Canada, says her department and the Canadian Food Inspection Agency (CFIA) have been monitoring arsenic in baby food, as well as water and other products, for more than 10 years. In an interview with Marketplace, she said she wants to assure parents that the products they are providing their kids for nutrition are "very similar" to those found internationally, "regardless of what the limits are or what the regulations are." Sharma agreed that studies show there may be developmental delays and behavioural changes with exposure to arsenic but believes more studies need to be done. Sharma, who is also a pediatrician, says she recommends to parents that fortified rice cereals can be part of a balanced diet, but it doesn't need to be the first cereal a baby eats, and it should be varied with other grains. Sharma also said Health Canada will be testing the products Marketplace identified and adding the products to its monitoring survey, in addition to looking at establishing guidelines for arsenic in rice, which the department hopes to set in the next few months. Do doctors need to give better recommendations? 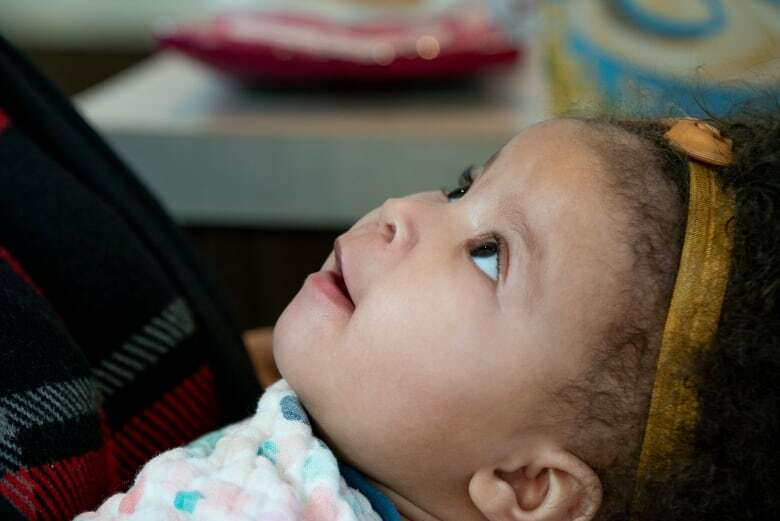 Marketplace spoke to several parents who said their doctors recommend rice cereal as a good first food for their babies, as it is often iron-fortified and easy to digest. But none of them said they were warned about the risk of arsenic in rice. According to Nestle, doctors need to offer parents better advice. "I think that doctors should know that rice cereal contains levels of arsenic that are potentially dangerous to babies and they should be making different recommendations," she said. Nestle suggests that parents stop buying rice-based cereal and instead feed their babies oatmeal or barley cereal to start, before offering a variety of foods. Marketplace also tested barley, oat and ancient grain cereals, and the results found they were all very low in arsenic, consistent with previous testing done by Healthy Babies, Bright Futures. Vary your diet, and try to choose a variety of grains. Soak your rice overnight, and cook it like pasta, draining off the excess water. This can reduce the arsenic by up to half. Brown rice generally has more arsenic than white rice, as the outer husk is not polished off. While white rice is generally lower in arsenic than brown rice, it also doesn't have the nutrients and fibre, so researchers say to vary these choices. Research from the U.S. FDA and Consumer Reports has shown that some rice varieties generally have less arsenic than others; look for basmati from India, jasmine from Thailand, and instant or short-grain rice from the U.S.
Organically grown rice absorbs arsenic the same way conventional rice does, so choosing that option will likely have little bearing on arsenic levels. "As a proudly Canadian company, we're committed to working alongside industry experts and the CFIA to ensure the highest Canadian food standards are created for all products," Baby Gourmet said. President's Choice provided a written statement, assuring customers its products are "absolutely safe for children" and the company takes every precaution to ensure PC products can be trusted by Canadians. President's Choice said that although the "extremely low levels" of arsenic found in its products "are not believed to pose a health risk," the company is "working with our suppliers to minimize these trace levels, and will use European standards as our guide." Although none of the other companies' results surpassed the European threshold of 100 ppb of inorganic arsenic, Marketplace reached out to all companies tested. The other companies indicated that they take the quality and food safety of their products seriously, and many of them do routine testing of their products and ingredients. Their full statements can be found here.